Aerial view of the Mill Lane looking north toward Amherst College and showing fields, livestock, gardens, houses, barns, etc. The Gaylord/Simeon Clark house (later the Lyman Thompson house) is in the foreground; and the Grist Mill is on the left. Just visible in the background is Johnson Chapel at Amherst College. This digital file may be used for educational purposes, as long as it is not altered in any way. Prior written permission is required for any other use of the digital files from the Jones Library. 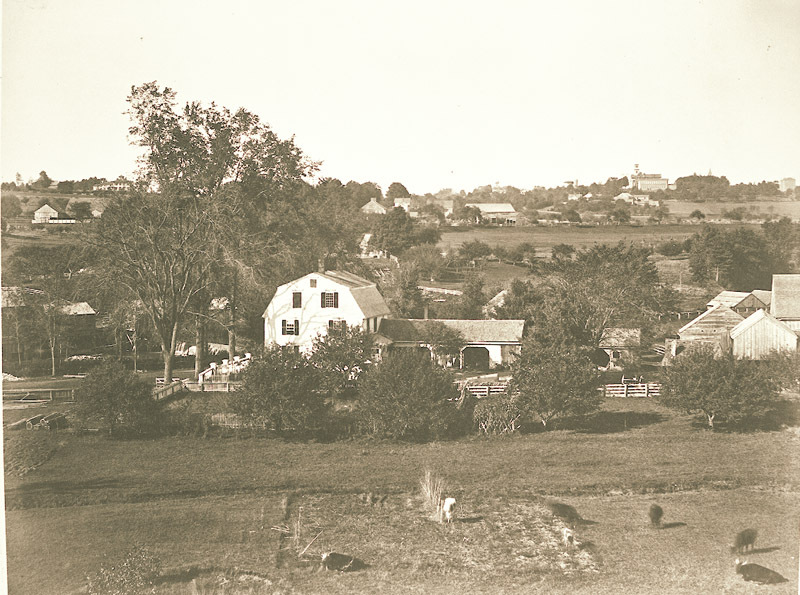 Lovell, John L., 1825-1903, “Area view of Mill Lane in Amherst,” Digital Amherst, accessed April 21, 2019, http://digitalamherst.org/items/show/433.